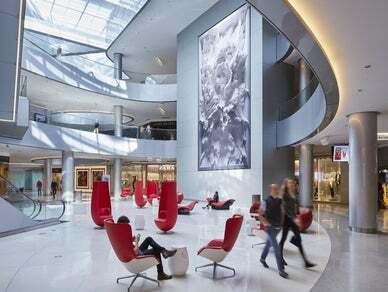 With LA’s largest collection of shops and restaurants under one magnificent skylight, the new Beverly Center reflects the diverse styles and tastes of Los Angeles and its many visitors. An unparalleled collection of luxury, contemporary and fast-fashion brands awaits shoppers, including Apple, Balenciaga, Coach, COS, Fendi, The Celect, G-Star Raw, Gucci, H&M, If & Co., Longchamp, Louis Vuitton, Maje, MCM, Michael Kors, Omega, Polo Ralph Lauren, Prada, Saint Laurent, Sandro, Salvatore Ferragamo, Superdry, Tiffany & Co., Traffic Los Angeles, Uniqlo, Versace, Wolford, Zara and more. An unmatched restaurant collection includes fine-dining options Cal Mare, Farmhouse and Yardbird Southern Table & Bar, and fast-casual eateries Eggslut, Easy’s, Tocaya Organica, Marugame Udon, LAMILL Coffee and Pitchoun Bakery & Cafe. More great additions, including The Webster, are coming soon! For more information, visit beverlycenter.com or follow @beverlycenter on social media.